Here's a conundrum for you: There are many things in life that some of us might be unfortunate enough to have to defend ourselves against - thugs, thieves, mobs... lions, tigers & bears - but there is only one power that has the potential to prevent each and everyone of us from choosing to think, speak and act in our interests, or in the defense of them. And of course that fearsome power is held by the very same institution which our society channels our collective power through, in order to safeguard those interests and actions for us: Government. That is a conundrum. Enter our Bill of Rights. Our 2nd Amendment was not written simply for us to have easy access to arms (guns, or any other form) - It was written and ratified as a 'No Trespassing!' sign to be thrust into the faces of that collective power of our society, who would understand it to be backed up by those personal arms each judges to be best suited to the defending of them, to dissuade us from intruding ourselves into those choices and actions that we engage in during the course of living our lives. Why? Not to fight against our society, but to live in liberty within it! If you can be prevented from having the means to defend your decisions, your life and your community, then you do not have the liberty to have or enjoy any of them. I'll repeat that: If you do not have the right to defend your rights, then you do not have the liberty to exercise them. Sure, your society may permit many, any or all of those actions you typically choose to take, but only by appointing someone with the power to grant (or deny) you their permission, which is a very different thing altogether - isn't it? For government to transform our rights into their permissions, it first needs the ability to disarm its citizens ability to resist it. The 2nd Amendment exists to prevent that sort of transformative trespassing. In fact, every amendment in our Bill of Rights, exist to prevent that. The existence of our Bill of Rights, and every amendment within it, is evidence of your liberty. Its compromise is evidence of your lack of it. Did you notice that when our Founders' said "Shall not be infringed", they were looking directly at you? "The conventions of a number of the states having, at the time of their adopting the Constitution, expressed a desire, in order to prevent misconstruction or abuse of its powers, that further declaratory and restrictive clauses should be added; and as extending the ground of public confidence in the government will best insure the beneficent ends of its institution;-"
IOW, We The People demanded that clear limitations be put upon our government's power to exercise its (our) powers, through law, for what would doubtless be seen as being for the greater good, because We The People understood so well that We The People are too prone to misuse power with "the very best of intentions". Our Bill of Rights comes down to us from those who had a clear understanding of our limitless ability to convince ourselves that doing what is wrong is ok, if, in our humble opinion, it is done 'for the greater good'. Our Founders - and in this case I am not talking about those who gathered to frame the constitution at the convention in Philadelphia, but rather of that general population of We The People - who on reviewing the Constitution which that 'assembly of demigods' had proposed, found it wanting. The people conditioned their acceptance of that document which was to define the limits (or lack of them) of our laws, on the promise that it be amended to prevent their new government from exercising its power in the most politically essential areas of our lives. Of those twelve amendments that were proposed, what became the 1st through 10th Amendments, were designed to limit and prevent We The People's best and brightest from using the collective power of their own government, to alter, limit, eliminate or otherwise violate the ability of any number of their own people from enjoying the liberty of those essential rights, 'for their own good'. These amendments are explicitly there, because their understanding of history taught them that tyranny couldn't easily rise to power, in the face of a people who were armed with the liberty to exercise those politically essential rights. The Bill of Rights, and the 2nd Amendment in particular, exist to prevent ourselves from using our own govt to do what it should not do. Not out of a fear of some anonymous 'they! ', and not because they feared some bogeyman called 'government!' - this is an important point that few seem to realize: they didn't fear someone else, they understood and feared themselves! Us! We The People! That we today have forgotten to even be wary of our own selves, and of our own good intentions, is a confirmation of how well placed those fears of theirs were - and how fortunate we are that they safeguarded our essential individual rights from us. How have we forgotten that? Easy - it was thought to be useful to. People too easily slide into tyranny. Have you ever wondered why? It doesn't really require any deep learning to understand, only a basic grasp of the fundamentals of human nature and a regard for what is in reality right and true. We are prone to becoming tyrannical, not from a desire to do evil (though true, some few may), but from our well intentioned desire to 'do good', even if that means imposing 'Good', upon others, to 'fix them'. For their own good. "...I saw something truly terrifying. I saw just how easy it would be, were I less involved and less certain of our nation’s founding and its history, to fall for the populist lines they were shouting from that stage. Above all, I saw how easy it would be to accept the notion that it was the government’s job to make sure that those things were provided." 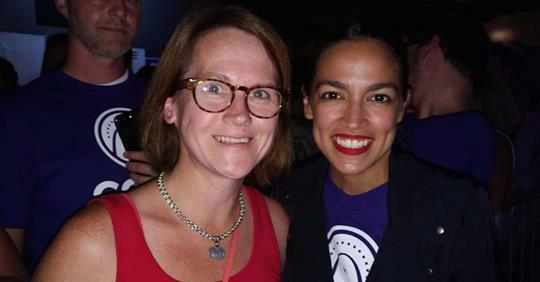 I watched as both Ocasio-Cortez and Bush deftly chopped America up into demographics, pointed out how those demographics had been victimized under the current system, and then promised to be the voice for those demographics..."
As they stare and yearn to 'do good!' with those policies, as they see that usefulness as being 'good', they are not seeing (or looking for) the fine print in what powers must be brought to bear upon (all) others in society, in order to do that 'good', and they are not seeing the ramifications of having done those 'goods' unto us all. It's conveniently not easy to see what is out of sight - but what they want it to be 'good' is easily seen; seeing how it could go bad... is... not what you're looking for when you're looking to 'do good'. If you'd like an example of doing bad for 'good' reasons, read all of Ginny's short piece linked above, and then read how it's deliberately parsed to alter her meaning in this, and so many others, so that what she said is easily ignored, and so that what she didn't say, could be criticized, as if it was what she had said. That's a lie... for the 'greater good'. These issues are 'the ends justify the means', in action - telling lies for the greater good, because they do not doubt that those 'goods' will be useful... no matter how often they have repeatedly resulted in disappointment, hardship, corruption, destruction, and eventually wide-scale death (and they can never do otherwise - in the end). People are rarely willing to see what they are doing, as being wrong. If you've ever looked back upon some dark point in time - present or past - and wondered 'how could they do that?! '; this is how they could, and did, do what they did - whether in Venezuela, Cambodia, Cuba, Red China, USSR, Nazi Germany, and so on, and so forth - the darkness we see in looking back upon those times, is not the darkness that they saw when looking around at what they themselves were doing. They saw in what they were doing, their good intentions, and they saw themselves as opposing that darkness which they did see all around them, which is what they saw as justifying those actions that needed to be taken 'for the greater good' - as they saw it. Those policies that Ginny listed - government provided healthcare, government provided education, government provided wages for the needy, and looking to government to provide privileges instead of upholding rights under law, those are the very same justifications for policies that were used to 'do good', in Venezuela, Cambodia, Cuba, Red China, USSR, Nazi Germany, and so on, and so forth. If you don't see that, it's because that is not what you are willing to look for. And yet it is true nonetheless. The motive power of pulling the saintly wool down over our own eyes, is Utilitarian in nature, through replacing 'The Good' with the useful, motivationaly empowering 'The ends justify the means! ', in which the 'good' (meaning...?) they intend to do unto you, provides them with all the justification needed to exercise whatever 'unfortunate' means might be necessary for that which they fear or desire. For the 'greater good'... as they see it. The problem is that "The Good", then, has less to do with what used to be described as the 'Good, Beautiful and True', and more to do with what is useful in getting what they desire - transforming it from what was good, in and of itself, into a means of the power to do something else... followed by something else... and always more something elses' will be necessary, for evermore. And by that time what was once understood to be 'wrong', is no longer seen in their mind as being wrong, or at least not in the same way; 'wrong' having been transformed into 'needed' - is almost certainly urgently necessary to do. Our interests and desires have a natural tendency to shift our awareness away from looking for what is right, good and true, into looking for what is useful, efficient and needful. It is in that action of shifting our ethical perspective, that we succeed in hiding the wrongful nature of our actions from our own eyes, eclipsing them with the more interesting 'good' which we intend to do, blinding us from the possibly unsettling (or even evil) nature of what is now clearly seen as being oh so necessary and useful for our chosen ends. If you are unaware of this tendency in yourself, then you are, in an important and essential way, uneducated, and a danger to yourself and to those around you. What a proper Education is supposed to accomplish, is to enable us to see this tendency in ourselves, and to question the reality of what we are so eager to 'see' as being so. Not to question reality, but to question our pretenses of it: Are we seeing what is, or what we desire it to be? "...We are told that the aim of Socrates in his training of the young was not to make them efficient, but to inspire in them reverence and restraint ; for to make them efficient, said Socrates, without reverence and restraint, was simply to equip them with ampler means for harm..."
Our Founders' generation was well educated on the whole, and so were wary of their own potential to do wrong for the best of intentions... but they were already well on their way to losing that habit of seeing their own shortcomings. The re-purposing of Education away from 'moral ambitiousness', towards economic utility, which even some of our Founder's generation helped to lay, laid down a foundation that our nation could not have been erected upon had it come just a few decades earlier, and those new inclinations have been weakening our true foundations ever since. What had soared from Locke to Adam Smith to Jean Baptiste Say and crested into Frederic Bastiat, was already giving way to its mirror imagery, in Rousseau, Robespierre, Babeuf, and then Marx and the swarm of 'isms that followed in their wake. IMHO, our Declaration of Independence, and our Constitution, were created, at the last historical moment that it was possible for them to be established, and just how close we came to being too late, can be seen in the success of the American Revolution, and the horrific failure(s) of the French Revolution so soon afterwards. We were at the peak point of a couple century's spread of common understanding of the ideas in those works that Jefferson had called 'the elementary books of public right', but their comprehension of them had hit its peak by 1793, and was already in the process of giving way to the up and coming mechanistic, utilitarian views. Those new directions are easily seen in what were popularized in Rousseau's enthusiasm for naturalism, over civilization, and in his popular reforms for Education, moving as they did away from striving to inculcate an intelligent virtue in mankind, in favor of a tantalizing and youthfully indulgent sense of self-fulfillment. Taken together, they served to move us away from our Founder's understanding of inalienable rights, and towards Jeremy Bentham's view of such rights as 'nonsense upon stilts'. I can't tell you how many times I've been in discussions with Pro-Regressives of the Left or Right - with those few who are at least willing to discuss their proposals - who will within the same sentence, chide 'the other side' for 'seeing every disagreement as of evil intent' and then go on to rail against 'the evil 1%! '; they'll roundly denounce the other side's use of the broad generalities of 'they' and 'always' when discussing their opponents, and then immediately denounce the 'Right' who are all 'greedy' and unethical. They will fume against the use of propaganda by 'Fox News! ', while demanding a restoration of state regulated and approved speech (aka: propaganda) through a new 'Fairness Doctrine'. Yes, that is nonsensical if you are focused upon what you see as being right, good and true. But for those that have replaced what is good (which in any meaningful sense, tightly integrates with all of your life, morality, manners, ethics, etc), with what they see as being for 'the greater good' (which needs have no more consistency with other policies you promote than the right people are for them - which is the entire point of pivoting their orientation towards power), they are simply seeking what is useful, efficient and needful to implementing the 'greater good' unto us, which, of course, makes 'perfect sense', and as such applications of force upon 'bad' elements, is necessary to achieving that greater good. For all. Obviously.. They do not see it as being wrong or bad, because their definition of 'good', now follows from the pragmatic ideal of 'what works' for the moment, instead of the ethical and philosophical ideal, of what is timelessly 'Right, Good and True'. What they see, is that what you do, is 'bad', because it conflicts with what they would have done. When they do the very same thing, it is 'good', because it furthers their good intentions. What this means for the use of political power, is that virtue - its substance, not simply the appearances of it - is no longer able to serve as motivation or guidance for them, only power can fill that role - not the power to objectively identify or correct wrongs that have been done, but the desire to forcefully act upon others, to do unto them, utilizing power that others will surely see as being useful and needed for 'the greater good' - that form of understanding is incapable of containing meaning that is in conflict with what you, in your own eyes, see as being useful. And still they do not see it. To be clear, this excuses them from nothing - they would see the wrongs in what they do, if they would put reality and truth ahead of what they wished reality to be, but they will not, and so they do not, and we all suffer the consequences, seen and unseen. The ability to see that what seems sensible to you, might pose unforeseen dangers to you and all you love, the ability to '...to be able to entertain a thought without accepting it...' is an important aim of an Education, to be "... released from a multitude of opinions...", and the distracting shadows on the wall of Plato's cave. Conversely, the inability to see - or to even look for - the possibility that what you see as being necessary and justified, just might endanger all, is a result of, in at least some significant area, a lack of education - particularly if you attained that ability through years of classroom earned degrees. The views of those educated as our Founders generation was, aimed at a pointed self-reflection that questioned what you were inclined to think seemed certain, that is what enabled We The People, to gift ourselves with our Bill of Rights. The views of those 'outmoded' ideals of education replaced with getting a good job, had an enthusiasm to act upon 'obvious' certainties, and is what is driving our current efforts to dent, damage and dispense with the protections of our 2nd Amendment, and the 1st Amendment, and all of the others, which enables us to be protected from 'the greater good' which they are so eager to do unto us - which is when We The People need to hold on to them more strongly than ever - not to fight our society, but to live in liberty within it. 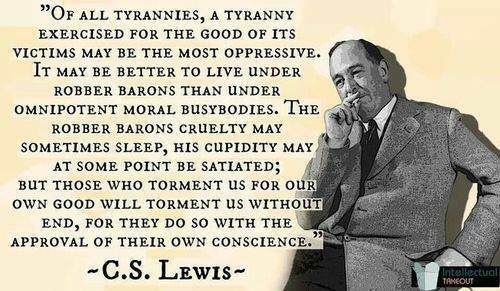 "Of all tyrannies, a tyranny sincerely exercised for the good of its victims may be the most oppressive. It would be better to live under robber barons than under omnipotent moral busybodies. 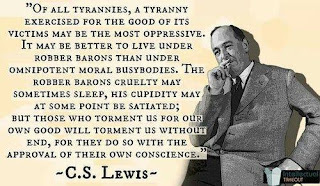 The robber baron's cruelty may sometimes sleep, his cupidity may at some point be satiated; but those who torment us for our own good will torment us without end for they do so with the approval of their own conscience." "The Humanitarian Theory of Punishment". "God in the Dock". Book by C. S. Lewis, 1970. And to those armed with good intentions - a power that is far deadlier than any material weapon - they will seek, use, and apply that power to achieve their ends, and they will do so with a clear and approving conscience. Tyranny is above all else, in the minds of those who deny they seek it, useful. Unless their minds are turned anew towards the nature of those essential rights that our Bill of Rights were created to protect, they will, with the very best of intentions, turn each of them against the other. How that is done, in the next post.